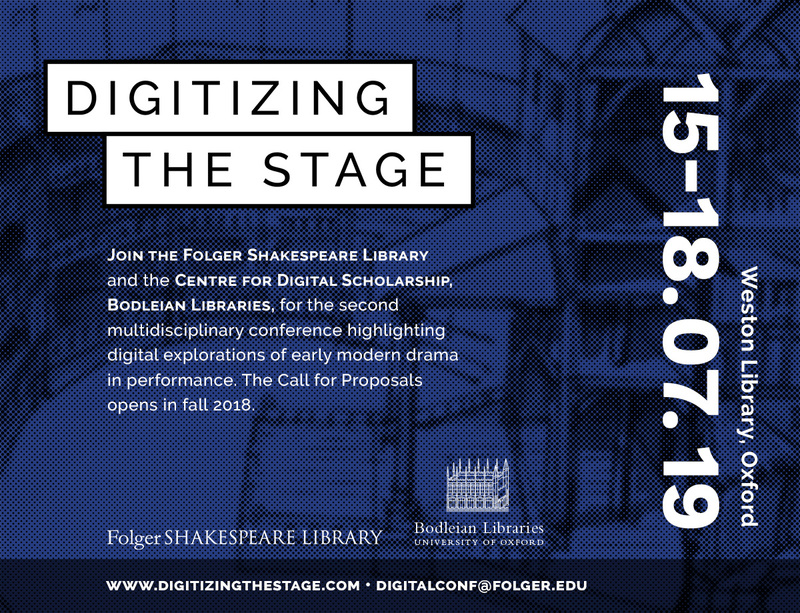 Together with the Folger Shakespeare Library, the Bodleian Libraries’ Centre for Digital Scholarship is delighted to announce that Digitizing the Stage will return next summer. The event will take place on 15–18 July 2019 at the Weston Library. There will be a small pre-conference workshop preceding the three-day, single-stream conference, which will have a renewed emphasis on performance. More information can be found on https://www.digitizingthestage.com. The inaugural conference in 2017 gathered scholars, librarians, theatre professionals, and others in a convivial and productive series of talks and demonstrations highlighting digital explorations of the early modern theatre archive. The success of the event was due in no small part to the energy, creativity, and thoughtfulness of the participants, for which we remain profoundly appreciative. Thank you for your interest and participation. If you would like to stay informed about conference developments, including the upcoming call for proposals, please email the Folger Shakespeare Library via digitalconf@folger.edu to be added to the 2019 mailing list.